My name is Ronald Farrell and I am a Lieutenant with the Charles County Sheriff’s Office in Charles County Maryland. Our agency was just notified that we were approved for a grant from Big Ben’s Foundation for the purchase of a K-9 for our agency. This means so much – that we are able to put another resource out to ensure the safety of our officers and citizens in our county. This was also somewhat personal for me since it is my birthday today, and it does get hard to celebrate on such a traumatic date (September 11th), but this news brightens my day, and along with that, I have been a lifelong Steelers fan. We are so grateful to Ben and his foundation for all the support for Law enforcement Agencies across the country. *And thank you to Lieutenant Farrell, Assistant Commander, Patrol Operations for the Charles County Sheriff’s Office! Photo: That’s PFC Behm and his K9 partner, Ryker on the left, and Cpl. 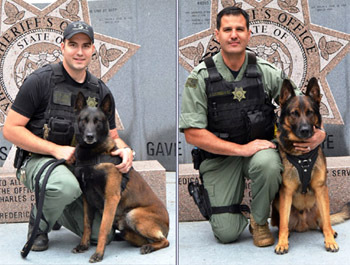 C. Clevenger and his K9 partner, Eno on the right. They apprehended three suspects in a shooting that occurred in Charles County, MD in May of 2014.